So, we’ve already covered how to weed out unwanted Facebook posts (random updates from high school classmates you barely remember, wedding photos from that frenemy at your old job, and so on) from your news feed. But what about the flip side—that is, stocking your Facebook news feed with gotta-see updates from your nearest, dearest friends and loved ones? Well, there’s an easy way to make sure you never miss a Facebook post from those in your innermost circle. The secret: adding your besties to your “Close Friends” list. Want to manage your Close Friends list? Start by clicking the link in the left column of your Facebook news feed. What’s the Close Friends list, you ask? It’s one of several lists you can use to organize your Facebook pals. 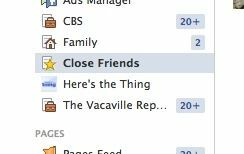 The “Acquaintances” and “Restricted” lists, for example, are reserved for friends (or so-called friends) you’d rather see less of—or not at all—in your Facebook news feed. If you add a Facebook buddy to your “Close Friends” list, however, you’ll see more of them in your news feed, and you’ll also get a little red notification badge whenever they post an update. And in case you’re wondering, no—your friends won’t know that you’ve made them a Close Friend (or if you’ve booted them from the list, for that matter). So, ready to start adding your BFFs to your Close Friends list? First, find a good friend you’d like to see more of on Facebook; you can use the search box at the top of the page, spot them in your news feed, or pick them from your main Friends list. Next, hover your mouse over their name; when you do, a pop-up with their profile picture, cover photo, and a few more details—including a Friends button—will appear. Hover your mouse over the Friends button to get yet another pop-up menu—and this time, select Close Friends from the list of options. Want a closer look at your Close Friends list? 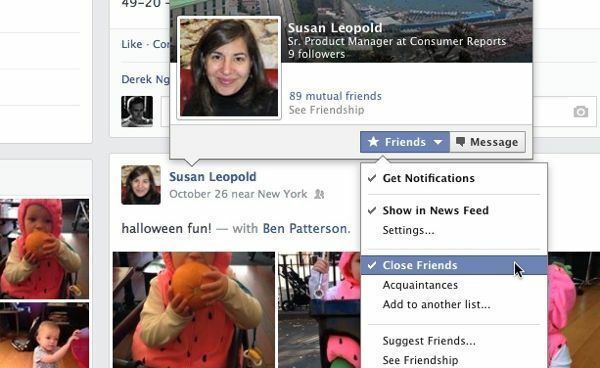 Go to your news feed, then click Close Friends in the left column. From here, you’ll see updates only from your Close Friends, along with suggestions on more friends to add on the right side of the page. To quickly add or delete people from your Close Friends list, click the little See All link in the top corner of the page, then click on a photo to add someone to the list or kick them off. By default, you’ll get a Facebook notification whenever anyone on your Close Friends list posts an update. Getting inundated by a flood of alerts? You can turn off Close Friends notifications by going to your Close Friends page (click Close Friends in the left column of your news feed) and toggling the Notifications button on or off.